Io - Homebrew - SMS Power! I've noted the suggested theme of romance and love. Considering the famous quote "I am not prepared just now to say to what extent I believe in a physical hell in the next world, but a sulphur mine in Sicily is about the nearest thing to hell that I expect to see in this life." this entry might be just a little bit off from the suggested theme. 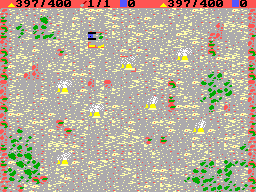 The game is about managing a sulphur mine. The main aspect of the game is to supply enough sulphur to your HQ by building a transportation network consisting of sulphur sources, depots, roads and rail. At the start of the game, you should first connect your first sulphur source to the HQ. Rail connections have higher capacity than roads, but need more time to construct. One unupgraded sulphur source supplies enough sulphur for one idle worker. Busy workers need twice as much. Building nodes in empty space results in sulphur depots. Building nodes on sulphur vents results in sulphur sources. The current tool can be changed by the second fire button or by clicking on the toolbar. The first fire button starts construction. the amount of workers and the sulphur consumption. You win the level by increasing this to 10.
cursor) and a clickable list of tools (you can also change the tool by using the right fire button). At certain moments,such as after changing the tool, the toolbar is briefly replaced by a display of the name of the new toll. When the cursor is a above a node (HQ, depot, source) of the transportation network, the toolbar is replaced by a status display. The status display shows the current amount of sulphur in the building under the cursor, and the sulphur storage capacity of the building as well as the level of the building. In case of a threat, the toolbar is briefly replaced by a descirption of the threat, and the background flashes. The game is meant for the SG-1000, SC-3000, Mark III and Master System. It was not tested on real hardware. but it seems to work ok in emulators. While Io is still work in progress (e.g. no sound or music yet, no sports pad support, no variation in levels) it is already quite playable. 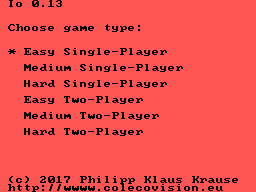 Early versions for the ColecoVision were presented earlier on the AtariAge forums (http://atariage.com/forums/topic/261988-homebrew-sulphur-mining-game-io/), but the version 0.12 submitted to the competition has substantial improvements over those earlier versions and is much more playable.